La Cuisine's LC 3180MB PRO Saute 3.75 Qt. 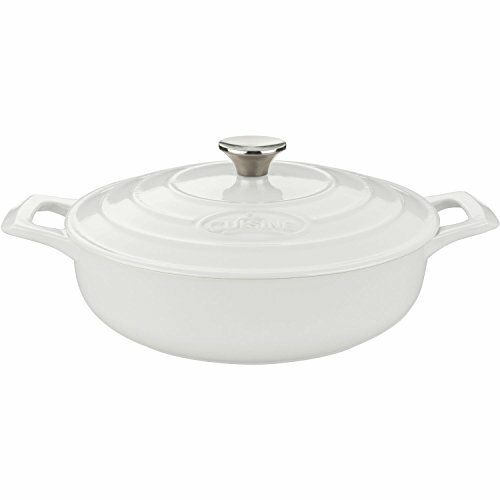 Cast Iron Casserole, in white, provides a beautiful presentation for rice or potato dishes. La Cuisine's PRO cast iron cookware is crafted using sand molds, which are used only once, forging a lighter product with a very fine enamel finish that is truly unique. Wonderfully versatile, La Cuisine's PRO saute casseroles are suited to the oven and all cooktops, including induction. Food heats through evenly and remains hot until served. The non-toxic, matte black enamel interior surface is scratch-resistant, stain-resistant, gives excellent food release that improves through continued use, and is simple to clean - just wash in warm water. Perfect for professional and domestic cooks alike, La Cuisine PRO gives you no-fuss, healthy cooking that looks great as it goes straight from cooking on the stovetop or in the oven to serving at the table or buffet (our trivets, sold separately, are recommended for table/buffet use).